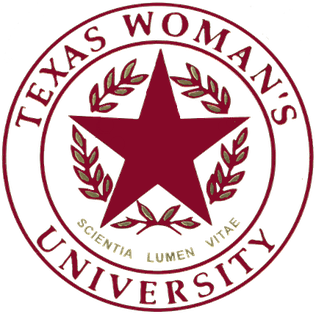 Official Seal of Texas Woman's University. Image available on the Internet and included in accordance with Title 17 U.S.C. Section 107. 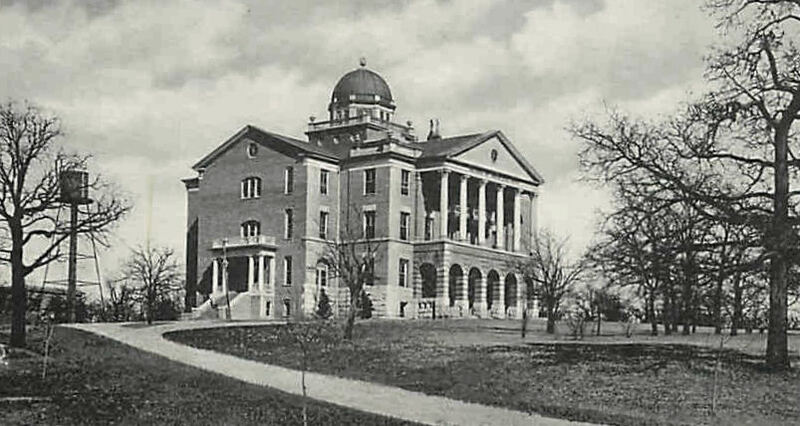 Old Main at Texas Woman's University (1903). Image available on the Internet and included in accordance with Title 17 U.S.C. Section 107. Faculty at Texas Woman's University (1903). Courtesy of the Woman's Collection at Texas Woman's University. Image available on the Internet and included in accordance with Title 17 U.S.C. Section 107. TEXAS WOMAN'S UNIVERSITY. Texas Woman's University was founded as a result of lobbying efforts for a state-supported women's college led by the Grange and the Woman's Christian Temperance Union, with the support of the Texas Federation of Women's Clubs and the Texas Woman's Press Association. Throughout the 1890s these organizations pressed for the establishment of a college where young women could receive a practical education, including training in the domestic skills that they would later need as wives and mothers. Enabling legislation was repeatedly defeated. Not until 1901, when the Democratic party adopted the idea as a platform plank, did the legislature authorize the founding of a college to combine the traditional literary education with instruction in the domestic sciences, child care, and practical nursing. A commission appointed by Governor Joseph D. Sayers selected Denton as the site of the new school in 1902. The institution began classes in 1903 as Girls' Industrial College, with an enrollment of 186 students and a faculty of fourteen. Helen M. Stoddard, Mary Eleanor Brackenridge, and Eliza S. R. Johnson were members of the original board of regents, the first women to sit on the governing board of a Texas university. After 1927 legislative mandate required that four of the nine regents be women. The name of the institution was changed to College of Industrial Arts in 1905, to Texas State College for Women in 1934, and to Texas Woman's University in 1957. In the initial years of its existence TWU was essentially a junior college for rural and small-town girls seeking vocational training. Since many came from areas without high school facilities, the first two years of the curriculum were preparatory; high school graduates went directly to the junior class. The first dormitory was opened in 1907, and a second classroom building was authorized in 1911. Although inadequate funding for dormitory construction kept enrollment below 2,000 until the end of World War I, the curriculum evolved and expanded. In 1914 President Francis M. Bralley initiated the four-year, college-level curriculum, and the first B.S. degrees were awarded the following year. The State Department of Education recognized the institution as a college of the first class in 1916, and by 1923 the liberal arts curriculum had been expanded sufficiently to qualify the college for membership in the Southern Association of Colleges and Secondary Schools. The institution was accredited by the American Association of University Women in 1925 and was placed on the approved list of the Association of American Universities in 1929. A home extension program was set up in 1911, and that same year the college held its first summer normal school. Texas Woman's University was the first educational institution in the state to offer instruction in home economics; graduates of its teacher-training program formed an overwhelming majority of the state's secondary teachers of home economics. A degree program in home demonstration, established in 1922, was the only one in the Southwest, and by the mid-1930s graduates of the university constituted one-third of the home demonstration personnel in Texas. The university granted its first master's degrees in 1930. Music Hall at Texas Woman's University (circa 1930s). Image available on the Internet and included in accordance with Title 17 U.S.C. Section 107. Pioneer Woman Statue at Texas Woman's University. Image available on the Internet and included in accordance with Title 17 U.S.C. Section 107. Although the Great Depression temporarily caused a sharp drop in enrollment, President Louis H. Hubbard took advantage of federal funds available through the Work Projects Administration and the Public Works Administration to launch an extensive building program that doubled instructional space and increased the value of the physical plant by one-half. A campus landmark, the Little-Chapel-in-the-Woods, was also a project of the depression. National Youth Administration recruits constructed the building, which was designed by a Dallas firm, and students in the art department designed and produced the stained-glass windows, which illustrate the theme "Woman Ministering to Human Needs." The statue of the Pioneer Woman, another landmark, was executed by Leo Friedlander and given by the state in 1938 to commemorate the Texas Centennial. In 1941 TWU became a member of the Southern University Conference. John A. Guinn, president from 1950 to 1976, oversaw a second major period of physical expansion. During this time the university also began to build a national reputation as a center for research in textiles, food, and nutrition under the direction of Pauline Beery Mack, dean of the College of Household Arts and Sciences and director of the Research Institute. Ph.D. degrees were awarded for the first time in 1953. In 1960 Texas Woman's University became a member of the Oak Ridge Institute of Nuclear Studies, and in the 1960s it received a series of research grants from the National Aeronautics and Space Administration to study the physiological effects of space flight on astronauts. T. Boone Pickens Institute of Health Sciences Dallas Center. Image available on the Internet and included in accordance with Title 17 U.S.C. Section 107. Texas Woman's University Institute of Health Sciences in Houston. Courtesy of Texas Woman's University. Image available on the Internet and included in accordance with Title 17 U.S.C. Section 107. Woman's Collection at Texas Woman's University. Courtesy of Texas Woman's University. Image available on the Internet and included in accordance with Title 17 U.S.C. Section 107. Male students were admitted for the first time in 1972. Enrollment stood at 8,483 in 1983, and faculty members numbered 648. In 1984 the physical plant consisted of sixty-seven buildings. In addition to a 270-acre campus in Denton, centers in Dallas and Houston provide instruction in the health sciences and related areas. The Institute of Health Sciences at Dallas has two campuses: the Inwood-Parkland Campus near Parkland and St. Paul hospitals and the Presbyterian Hospital Campus on Walnut Hill Road. The Institute of Health Sciences at Houston is in the heart of the Texas Medical Center. Construction on a new library for the Denton campus was completed in 1985. The Denton campus also operates the Southwest Institute of Design, a program cooperatively conducted by the university and the fashion industry. In 2000 library holdings included more than 559,000 volumes and more than 8,000 periodicals. 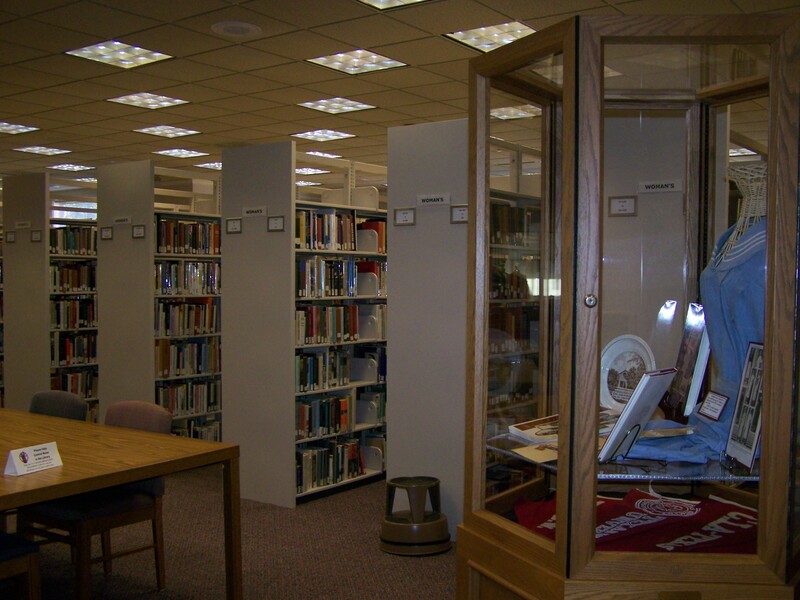 The library also housed the Woman's Collection, which includes more than 39,000 books, as well as major microform collections. 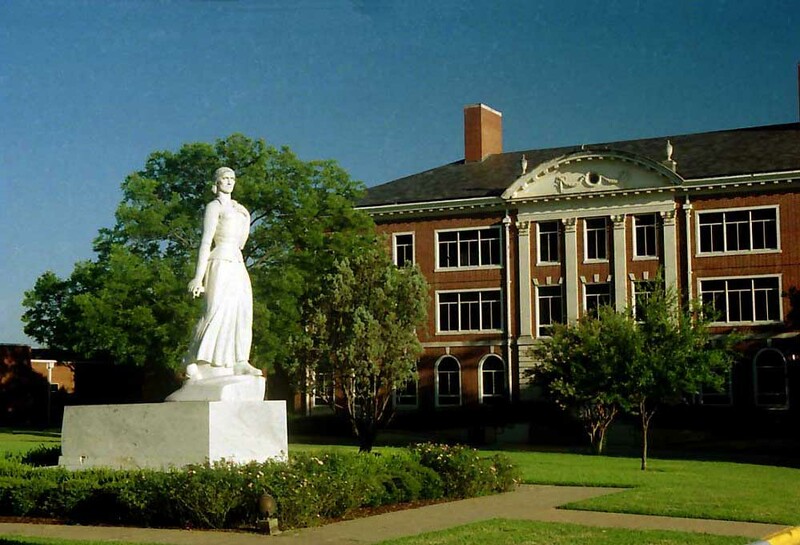 In 1979 the legislature authorized the establishment of a Collection of the History of Texas Women at TWU. The collection includes the gowns of the first ladies of Texas, given to TWU by the Daughters of the American Revolution, and Texas Women: A Celebration of History, an exhibit and archives developed by the Foundation for Women's Resources in 1981. In the fall of 1991 total enrollment of TWU stood at 9,412. Undergraduates made up 57 percent and female enrollment 93 percent. About 50 percent of the students were enrolled in the health sciences. The faculty in 1991 numbered 500. Enrollment in the fall of 2000 was 8,404, with a faculty of 762. Nursing was the largest undergraduate major, with 1,072 students. 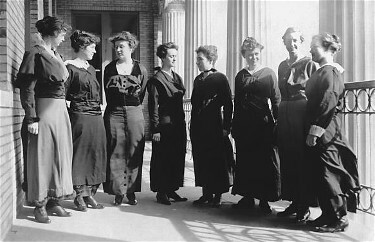 The presidents of Texas Woman's University have been Cree T. Work (1903–10), William Bennett Bizzell (1910–14), Francis Marion Bralley (1914–24), Lindsey Blayney (1925–26), Louis Herman Hubbard (1926–50), and John A. Guinn (1950–76). Mary Evelyn Blagg Huey, an alumna of TWU, became the seventh president and the first woman president of the university in 1976. In 1986 she was succeeded by Shirley Chater. Patricia A. Sullivan served as interim President from 1993 to 1994, and Carol D. Surles succeeded her in 1994. Beverly Byers was interim president in 1999, and Ann Stuart became the tenth president and chancellor in 1999. Carine M. Feyten became the eleventh president and second chancellor in 2014. A. Elizabeth Taylor, A Summary History of Texas Woman's University (Denton: Texas Woman's University, 1971). Joyce Thompson, Marking a Trail: A History of the Texas Woman's University (Denton: Texas Woman's University Press, 1982). Edmund Valentine White, Historical Record of the Texas State College for Women (Denton: Texas State College for Women, 1948). Handbook of Texas Online, Joyce Thompson, "TEXAS WOMAN'S UNIVERSITY," accessed April 20, 2019, http://www.tshaonline.org/handbook/online/articles/kct37. Uploaded on June 15, 2010. Modified on May 3, 2017. Published by the Texas State Historical Association.